Dearest Gap, how I've missed you. I've been unfaithful for many a month, with a flirtation here, a dalliance there and many a shopping bag everywhere else. But your summer charms have seduced me once again. So much so, I'm taking you straight to bed with these pretty print pyjama bottoms. 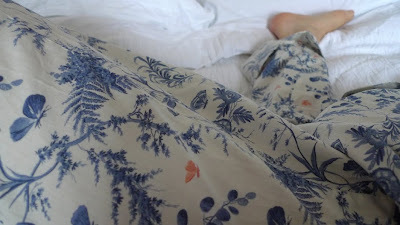 My heart has been won with the soft cotton, the flash of pink with the drawstring waist, the fabric-covered buttons, the patch pockets at the front and the cute turn-ups (should I wish to reveal a little more leg). All that attention to detail for less than a twenty (£19.50). And my, how you tease me with matching bras, knickers, camisoles, shorts and slips, all in the very same delicate print. I'm ready to fall head over heels. that print - goodness its a beaut!